Click here to see our comprehensive visual guide. View a full gallery and find additional information here. 2012 Topps Finest Baseball sticks with what the brand is known for: Refractors and rookies. The set has a ton of them, along with plenty of autographs and die-cut inserts to keep collectors busy. The base set comes with 100 cards: 65 veterans and 35 rookies. 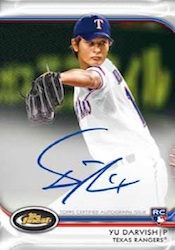 Among the key players in 2012 Topps Finest Baseball is Yu Darvish, who figures prominently on several different autographs. Twelve-pack master boxes are split into two mini-boxes. 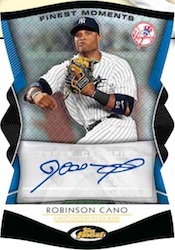 Each 2012 Topps Finest Baseball mini box has either an on-card rookie autograph or an autographed rookie jumbo relic. Good: Topps Finest is almost always a solid premium product. This year's does little to disappoint. The list of autographs is spectacular, mixing top rookies with many veteran players. Each box has a nice variety of colored parallels. On top of this, there are die cuts cards for the Finest Moments and Faces of the Franchise inserts. With nice sharp edges and tasteful designs, these cards give the collector the feel of pulling a trophy. Bad: Although the checklist seems pretty extensive, there is always a possibility of getting a couple of low-end hits. Another bad thing about these cards is that you can really see fingerprints on the card stock. Although there are on-card autographs, there are also many that use stickers. 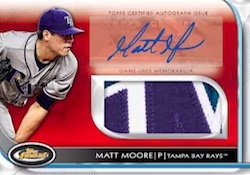 The Bottom Line: The variety of autographs and relics in 2012 Topps Finest Baseball add some nice chase options. Different background colors and die-cut inserts make for a fun break. But at this price, I would have expected a little more value. 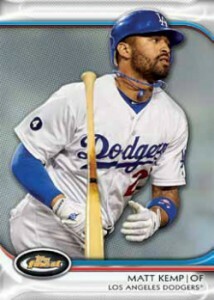 I love the glossy look of 2012 Topps Finest Baseball. The card stock seems better this year than in past releases. They don't seem to warp as much. The simple yet elegant design of the front is pleasant. I love the die-cut inserts. The Finest Moments have a nicely proportioned and balanced feel. Faces of the Franchise give a more elegant feel, looking almost like a trophy. The Game Changers is a little more bland. It has a medium-sized picture of the player on one side with a large team logo on the other side. It would have been nicer to have seen a bigger picture on these cards, but nonetheless it was a relatively cool design. Rookie Autograph Variations are on-card, which is alway welcome. Unfortunately, Autograph Relics have sticker signatures. The swatch on the card is relatively big and has a nice overall look to it. The color variations, which is typical in Topps Finest products, are extremely sharp. They make for a a fun chase for player collectors. The checklist is extensive, ranging from the big-name rookies (Bryce Harper and Yu Darvish) to young stars (David Price and Starlin Castro) to veterans (Albert Pujols and Justin Verlander). This product is ideal for collectors who like rookies, team collecting and colorful parallels. There are many different autograph inserts but only a couple of relic sets. At around 100 dollars a box, I expect more, even with the potential of hitting a Bryce Harper or Yu Darvish autograph. There are some other decent prospects to pull, such as Yoenis Cespedes, Matt Moore, and Trevor Bauer. Even with these strong players, there are lots of others who aren't nearly as desirable. The variety of inserts and other cards do help soften the blow if the hits aren't as strong. Although it may not have the best value, 2012 Topps Finest Baseball is still a fun box to break. Although the hits are a big part of the set, they aren't the only thing. The strong design, many color variations and interesting basic inserts give collectors a lot of variety as they rip through their 12 packs. Finest still a great product. Pulled a Trevor Bauer Xfractor auto jumbo relic and a Triple auto (Darvish,Moore, Montero) /5 out of a master box. Good rookie selection also. 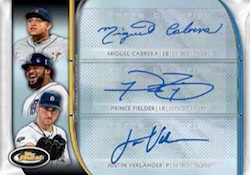 Finest is another beautiful looking set put out by Topps. However, that’s all it seems to have going for it. At the high price point, there is not much variety to go around. My master box had an auto and a relic auto. While I am great full for what I got, I have to admit I was a little clueless as to who they were. Notch this up under the lottery category. I like the design a lot and a good group of players selected for cards. I have a question though… Iwakuma is listed as an autograph rookie card but I have never seen one (Ebay, google image search, etc…). Does this card exist?